In today's world there are many wireless networking softwares on internet.most are costly & they asks for money to unlock all features of the program & they runs heavy services on the user's computer then user have to uninstall those programs. But Revsoft Hotspot is a light weight & free solution as compare to those softwares.Revsoft Hotspot doesn't runs any heavy processes on user's computer which slows down pc.It have many features like automatic internet sharing, Adapter detecter & many more.user is able to start hotspot with just one click. If you are using a tablet or a smartphone, then there is a very good chance that you have a personal hotspot option at home, in addition to your standard connection. However, setting up a hotspot may not be as easy as it would seem when you are using an older Ethernet connection or use a dongle to connect your laptop to the Internet, for instance. 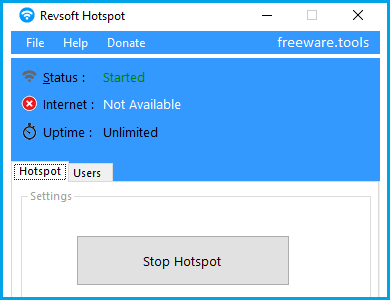 Revsoft Hotspot is a lightweight application that enables you to set up a WiFi hotspot on your computer without the hassle of configuring the parameters for the network. First off, you should know that the application does not work unless you already set up a wireless connection. Therefore, if you did not set it yet, access the default Network Connection functions and follow the step-by-step guide to creating your WiFi network. The program comes with a sleek and stylish interface that consists of the main window with two tabs. In the upper section, you can preview the status of the app, whether or not the internet is available and the uptime. In the lower section, you can specify the details of your wireless connection. The application is as simple as it gets, particularly since setting up a hotspot is a simple, 3-step process. More exactly, you can specify the network name or SSID, enter your password and access the Start Hotspot function. While you can allow the app to auto-detect the Internet connections available, you can also select the LAN that you want to share. Since users require your password to access the connection, you have complete control over who you are sharing the Internet with. In addition, you can set the program to send you notifications when users are attempting to connect to your network, a feature that can be helpful when you are trying to download a large file for example. If you would like to have more flexibility in accessing web-based applications from your smartphone or tablet, then Revsoft Hotspot could give you a hand with setting up the wireless hotspot.